I told her how I love savoury muffins and that it is a pity most people associated baking with cake and cake is sweet and hence all baked goods are expected to be sweet. 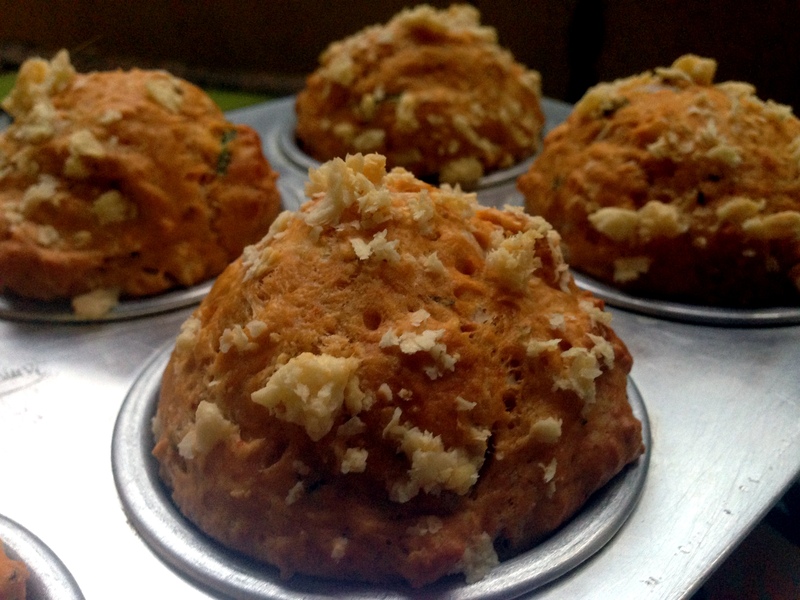 In my baking classes, I used to teach a savoury pizza muffin, but due to it having not too many enthusiasts, I changed that over to a sweet variant. For this muffin, I eyeballed all the ingredients and it turned out wonderfully fluffy and full of flavour. I ran out of whole wheat flour, and have used half of all purpose flour and half whole wheat, feel free to use whole wheat flour for the whole amount, but expect the crumb to be a little grainy. The pizza sauce I used is the one I posted in the Fusilli with pine nuts recipe. This is an all purpose pizza / pasta sauce that is very handy to have in the fridge. Preheat the oven to 185 C and brush the bottom of a muffin pan with oil. For an even brown crumb, do not use muffin liners. In a bowl, add the all purpose flour, wheat flour, grated cheese, salt, baking powder, baking soda, chopped onion and basil leaves and toss well. In another bowl, add the egg and milk and whisk with a fork. Add the pizza sauce and mix it well. Add this mixture to the flour mixture and with a light hand, mix till the batter is just combined. Spoon the mixture into the muffin cups equally, garnish with the reserved grated cheese. Bake for 16-17 minutes, testing with a toothpick for doneness. Cool in the pan for 3-4 minutes before running a blunt knife around the edges of the muffin pan and removing them to a cooling rack / serving plate. These muffins are best eaten warm. Can be stored refrigerated for upto 4 days. I love savoury muffins. Its like the anti-muffin. 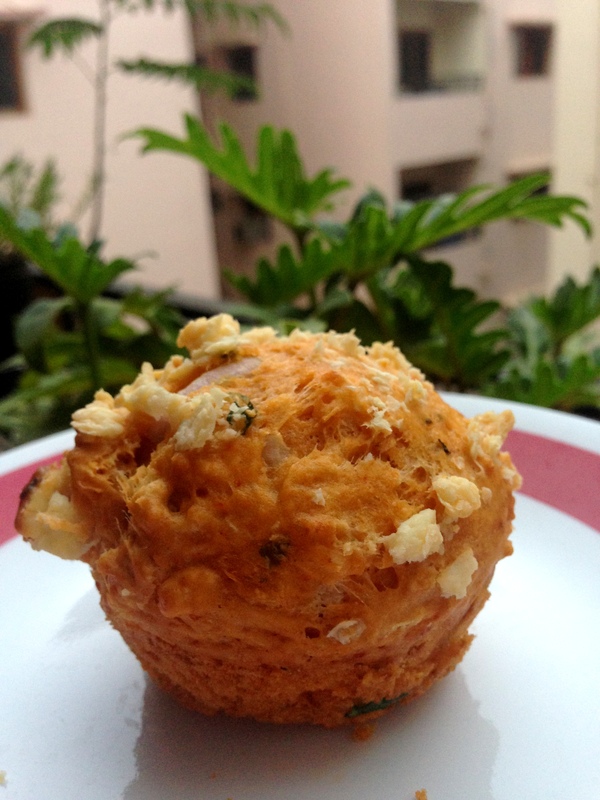 Iv made them once, cheese and cherry tomato but they didnt turn out fluffy and soft like muffins ought to be. These look WOW. Wants to makes now! I, for one, love savory muffins. I am going to try this out this week most prob. I think some cornmeal might also be good in place of some of the flour. will try it out and let you know. Hi Nikita. Yes cornmeal would be nice and will add a different texture to this. Glad you liked it. When you try it out, please let me know how it turned out.